It wasn’t a small still voice that motivated Suzanne Dice to help those who were feeling the effects of Superstorm Sandy nearly a year after it had slammed the New Jersey coast. It was her own internal storm that led her and her family to start an organization that helps feed those in need on weekends. “I was just driving down the street, and seeing all of the loss and destruction still there, it was like a punch in the stomach,” said Dice, a UMC of Red Bank member who lives in Middletown. “I could not, not do something.” That feeling was reinforced during a church service at Red Bank when an elementary teacher stood up and asked for prayers because she knew some families were still struggling from the effects of Sandy. In the fall of 2013, during a dinner conversation among Suzanne, her husband Keith, and children Amanda, Aidan and Jake, the Backpack Crew was born. The Dices began taking food donations and putting them in backpacks for a local school to give to those in need each Friday. The requests went from three during the first week to 25 by the third week. The idea is to make sure that children who are on a reduced or free school lunch program during the week can also have good meals every day. 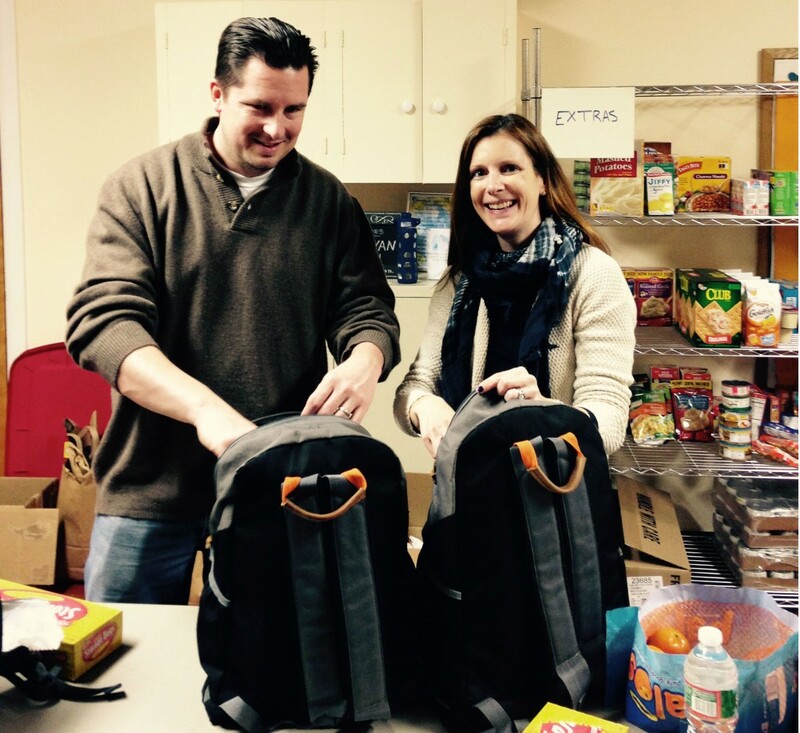 “We pack backpacks so we can feed an entire family over the weekend,” Suzanne Dice said. “We keep it as healthy as possible. There are two options for breakfast, lunch and dinner plus snacks.” The backpacks are delivered every Friday to a school nurse, who distributes them to the families in need. The Dices and others who help prepare the backpacks don’t actually know who gets them. What the Dices did know rather quickly was their basement was going to be too small for what needed to be done. The Backpack Crew’s new home soon became the UMC of Red Bank. “The church is our main support system,” said Suzanne Dice. “They constantly have a food drive and we have a shopping cart by the backdoor. As the word spread, different businesses around town have put boxes in their lobbies for donations, too.” Dice also mentioned that there have been financial donations from various organizations such as Girl Scout troops giving money from cookie sales and other groups doing coin drives. Dice added those who help include several people inside the UMC of Red Bank.